Electric Dipole Ver. 2 simulation lets you vary distance between two charges in any direction and distance from the charges while interacting with the model figure itself. In Horizontal and Opposite modes, selected from the GUI only positive charge, RED disk, can be dragged. In the independent mode RED and GREEN disks representing +ve and -ve charges can be dragged independently. The blue thick line is dragged vertically. 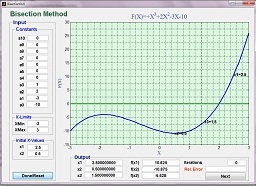 The following zipped Mathematical Models are designed in MATLAB GUIDE for the students to get familiar with MATLAB GUI and simulation programming.